When folks hear that we homeschool, the reactions can be unpredictable. We’ve seen the whole range of emotions from joy and excitement to envy and jealousy, to fear and even open hostility. It’s amazing how passionate folks can be about this topic. Well… I know which side of the fence I’M on! How about you? And why we do it anyway! 5) You’re not a certified teacher! 4) But they won’t have a common frame of reference with their peers later in life. I like this one. Mostly because it almost seems to be a plausible issue. But then about 0.00352 seconds later I remember that I don’t want my kids to have that “common experience” with the rest of those poor dears. Nope. I would much rather help them cultivate a deep and loving relationship with their parents and siblings while they learn and grow with me. 3) You’ll hate being around your kids so much! This one makes me cry. It really does. I cry for the families that have no idea how amazing it is to know each other so well, to grow together, to support and help each other, to feel totally fulfilled by the tight family bonds that are formed on this amazing journey. Now, I’m not saying that I don’t need a break every once in a while because I’d be lying if I didn’t admit to hanging out in the bathroom sometimes when I didn’t really need to use it. I think everyone needs a few moments to themselves. But I would never trade the awesome relationships we have in this family to get away from my kids for a while. 2) They won’t really learn much, though. There are a ton of statistics out there that prove this statement wrong, but let me just say this: I know that my kids will learn and are learning because I’m with them every day, helping them discover the world. We probably learn about a greater variety of things than they can cover in a school because we have the luxury of taking a few days to explore an interesting topic without fear of not finishing the lesson on time. We cover more in a much shorter amount of time and as a result, we learn. Yes. We learn in our home, outside of our home, in the museums, libraries, zoos, parks, and even in the grocery store. All without a certificate to say we can. 1) What about socialization! Your kids will never learn how to act with other kids their age! Oh.. and one more thing: Kids learn how to act like kids from other kids. This may be why they keep acting like kids when they are all grown up and should know better. They don’t know better because no one showed them how to act like an adult. I’d rather they spend their time around all different ages instead. So there you have it. My answers to the most common complaints about homeschooling. Do you homeschool? What do you hear most often? 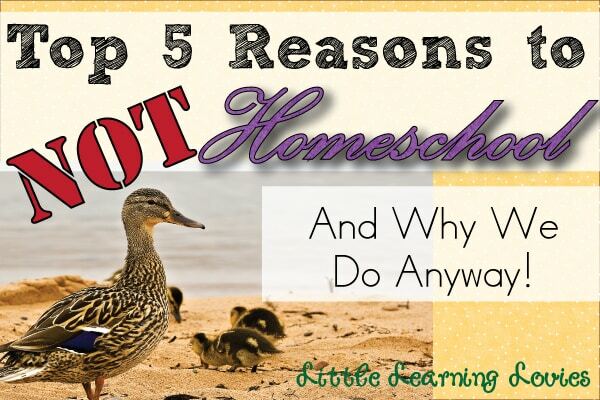 And if you don’t homeschool, what do you worry about for your homeschooling friends? I just wanted to say that as a certified teacher I support your right to homeschool. However, not all folks who homeschool are as dedicated. 🙁 And, also, just as you wish people not condemn you for your decision, please do not look down upon those who send their children to school. Your “poor dears” comment seems a bit judgemental to me. Every child’s needs are different, even within the same family, and public school serves many just fine, just as private, charter, Montessori, etc. also all work for different children. When someone asks me why I homeschool, I give them just a couple quick reasons THEN I ask them “what made you decide to public school your kids?” Often I don’t even get to ask cuz most people will say they couldn’t do that cause they don’t have the patience. Or need the time away from their kids (which I agree is so painful to hear). I LOVE the socialization part. I get compliments ALL the time about how well behaved, fun, and smart my kids are. But I still get asked about socialization when people first hear that I homeschool. I’m in direct sales, and bring my kids with me to most of my parties (“playdates”), my daughter dances twice a week and my son is in Tae-Kwon-Do. Plus, come on… we have friends!! Funny how nobody takes that part into account! Don’t forget the grocery store, library, post office, bank… where other people are. It’s not like we stay inside our homes all the time, never getting out! I hope this sheds a little light to those who haven’t even slightly considered homeschooling. I, too, have people tell us all the time how polite and well behaved my children are. They are not angels, I tell you! But I think it’s all because they have no problem talking to people, they answer when they are spoken to, they respect people who are older than them and they are kind and careful with people who are younger. I’m not sure they would have had a chance to learn these things if they had gone off to school all day! I love this. I actually am a certified teacher, but that doesn’t seem to matter. Once I tell them that tid-bit they say “what about socialization?” Or “You are a teacher and you Homeschool!? Why?” My standard response “because I taught in the schools” We send our children to school to learn, not make friends or get an A. At home my kids learn and right along with them. Everyday I learn things that we were never taught in school. I love this! Thanks for sharing your experience as a teacher and home-schooler. It’s a great perspective to hear about! Thanks so much for sharing with us! I always love the concerns people whether family, friend, or strangr gets so concerned about only child’s socialization skills, one of our former neighbors was always willing to point out his intelligence and was sue that was because of his being homeschooled but then she would next point out that he talked to her like adult to adult rather than child to adult and that was a BIG concern for her. I love this post. I have the most criticism coming from my family 🙁 Sometimes it is awkward and I just try to avoid the whole conversation. Especially because I am a SAHM. They always ask my husband when am I going to work? The “work” I do raising my kids, feeding them home cooked meals and tending to our house don’t count. It is depressing at times. It all goes away when I see that light bulb go off in my kids heads and they learn! We laugh and have a good time learning together. Carla, sometimes people think is perfectly ok to put down women who choose to take care of their family’s needs over working outside of the home. This seems to also be flip side of the coin as well when a woman works. These people need to be told that they cannot have their cake and eat too, so to speak. I Love that! lol I’m not sure what it is about homeschooling that brings out the parenting/educating ‘expert’ in people. I think it’s because we don’t do it the way everyone else does it. After all, only about 4% of kids in America are homeschooled, though the number is growing quickly. We are outside the norm and I think some parents feel like we’re saying that we know better than they do just by choosing a different path. I have seen some parents totally threatened by us and others envious that we had the courage to choose this for our family. So I don’t think they feel ‘qualified’. I think they might feel, without even realizing it, that they need to either defend their choice or tear down our choice. I used to get alot of those comments, at the grocery store, the post office and the bank…. but we live in a small town, the same people see us over and over. After a while what I started to hear was, your children are so well behaved! And they began conversing with them beyond “how are you?” and really getting to know them. Now my 8 year old does some shopping on her own and I know that when it comes time to let her spread her wings in those situations, there are people there who I can trust to watch out for her and help her if needed. And it has given her (and my other girls) a huge community in which to learn and communicate and thrive. Win! Win! Win! Alex, that’s awesome! 🙂 That’s how it should be, I think. Instead of kids being isolated and “misunderstood” they can be loved. Cherished. Cared about! What an amazing way for a little one to grow up! great post. I so agree. we get mixed reactions too and I jave definitely heard all these. loved the post! !